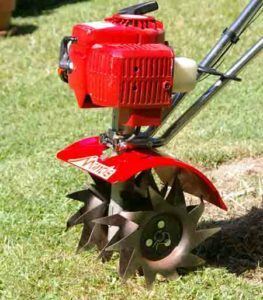 Roto-tilling uses a machine with a set of rotating tines that cut into and blend the soil. It has an adjustable depth, allowing you to set the depth you wish to till. You do not have to till very deeply to remove the existing vegetation. You just have to get to the root depth. 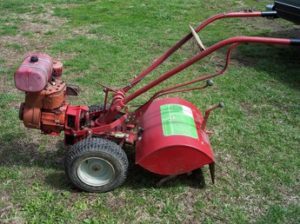 There are two basic types of tillers – front tine and rear tine. A front tine tiller can be a challenge since they have a tendency to behave somewhat like a bucking bronco. If you are going to till to remove existing vegetation, I recommend renting a rear-tine tiller. The small machines you see advertised as “tiller-cultivator” should never be considered for this job. They are designed to handle small areas of previously prepared soils. Technically they “till”, but they are truly designed to cultivate, turn under weeds, and mix in amendments. Begin by watering the area deeply a day or two before you intend to till. Mow the existing vegetation as short as possible. You can even “scarf” the ground with a weed-eater. Set the depth adjustment at the shallowest setting. Make overlapping passes back and forth over the entire area. This first pass will not look like you have accomplished much, but it is important to keep the first pass shallow to begin breaking through the roots. Set the depth adjustment to the next setting and make overlapping passes over the entire area again, but at a 90-degree angle to your first pass. In other words, your first passes will be side-to-side, and your next passes will be up-and-down. Continue this procedure, adjusting the depth one setting each pass, and alternating directions side-to-side then up-and-down. If you get resistance from any set of passes (the tiller will bog down a bit), make another set of passes at the same depth, no deeper. Stop when you have reached the depth just below the roots. Rake up the loosened pieces of grass and runners. Let this sit for several days to a week and repeat the process. You won’t have to start with the shallowest setting on your second go-round. The goal here is to break up and kill the existing vegetation. If you are concerned about perennial weeds such as nutsedge, or about germinating weed seeds, you can water the area after tilling, wait 7 – 10 days and make another set of passes. If you intend to continue on to prepare the soil by tilling, you will be tempted to just till all the grass under and keep going. Your results will be more satisfactory if you stop at the vegetation removal stage, rake up runners, wait a few days, and then continue the process. This will mean that you have to rent the machine twice, but your results will be worth it.